Synology® DiskStation DS213j is a budget-friendly 2-bay NAS server for small offices and home use, specifically designed to provide a solution for file storage and sharing with data protection for your home environment with low power consumption, quiet operation and reliability. Running on DiskStation Manager (DSM) operating system, it delivers ease of use and variety of features. SKU: DS213J-6TB Category: Entry Level 2 Bay NAS Servers. With a RAID 1 configuration in a Windows® environment, Synology DS213j delivers read and write speeds of over 100MB/sec and 70MB/sec respectively, allowing you to share an entire Blu-ray quality video in less than 3 minutes. The built-in Floating-Point Unit CPU speeds up thumbnail processing to enhance photo viewing at different resolutions, while the large 512MB RAM ensures maximum speed when running multiple multimedia applications. Synology DS213j is designed with energy efficiency in mind. Not only does it provide a large 92mm fan and smart airflow to keep the system running cool 24/7, but its noise dampening design makes it quiet compared to a public space in a library. Support for Wake on LAN/WAN, multiple scheduled power on/off, and hard drive hibernation can further reduce power consumption and operating costs. 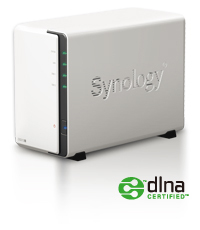 DS213j with Synology Hybrid RAID helps you balance storage capacity and data redundancy so you can have your space and use it too (custom RAID configuration available for advanced users). Your DS213j is also the ideal one-stop centralized backup solution: from PCs to NAS, NAS to NAS, NAS to peripheral storage media (such as USB stick) or NAS to remote storage via a whole host of options. Feed your data-appetite with Download Station, your 24/7 download portal. With its comprehensive built-in BT search engine, you can find and download files in just a few clicks. So turn off your PC and let your DS213j download all your content directly to your centralized storage. With DS download on iPhone® and Android™, you can manage download tasks even while on the go. Enjoy multimedia easily with Audio Station, and Video Station. Find movies and TV shows online or record your favorite programs with a DVB-T stick, and play them on all devices including Windows, Mac®, DLNA, AirPlay®, Bluetooth, iOS, Android, and Windows Phone. Take photos on your mobile device and let Instant Upload automatically send them to your DiskStation so they are ready for sharing through Photo Station or social networks including Facebook, Twitter, Plurk and Picasa. QuickConnect and EZ-Internet configure your DS213j for accessing over the Internet with minimal effort. Combined with Synology’s mobile apps for every popular feature, including DS photo+, DS audio, and DS video for anywhere multimedia access, DS download, DS file, and DS cloud for seamless file download/access/synchronization, DS cam for home security, you can enjoy your NAS anywhere, any time. Synology DiskStation Manager (DSM) is a web-based OS that provides private cloud service. It is designed to make your everyday living easier. The built-in Package Center allows you to download and install the packages designed specifically for your unique needs, whether it’s sharing files on the cloud, sharing photos on an online album, setting up a VPN environment or even an antivirus to protect your system. All will happen with just a few clicks. The simple interface allows you to obtain and configure storage capacity with minimal friction. It provides you with complete control of your personal cloud and lets you access it anywhere. Synology DSM will help you maximize productivity and get more out of your digital assets with minimal fuss.